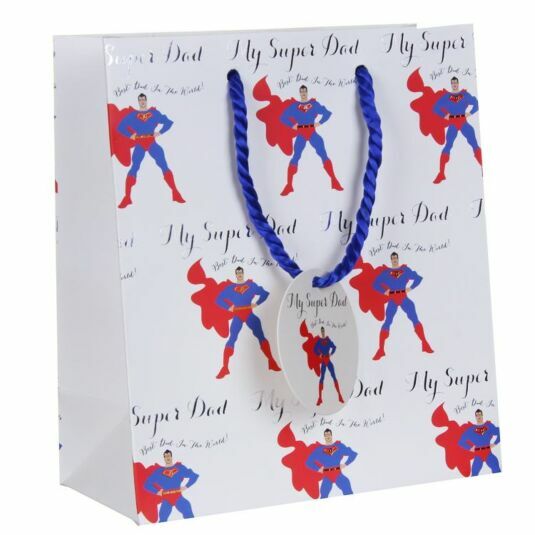 Celebrate the superhero figure in your life with this fun and vibrant gift bag, the perfect finishing touch to a thoughtful gift for your father. This text is printed in a mixture of reflective silver material and black font, making this gift bag really stand out when presented to a loved father figure. The Medium size of this gift bag makes it perfect for holding such gifts as clothing, toiletries and many other gifts. This bag includes two blue rope handles for easy carrying and a circular gift tag for you to write your personal message on. Celebrate any occasion with your father with this complimenting Super Dad Medium Gift Bag.